When first introduced to investing, people are often told that the stock market offers around 10% per year. Meanwhile, bonds offer a mid-single digit return annually. However, these average numbers rarely reflect what’ll happen in any single year. In fact, it’s actually rare to see the stock market return 10% in any particular year. But on an annualized basis, historically, the market is more likely to deliver these average returns the longer you hold these investments. 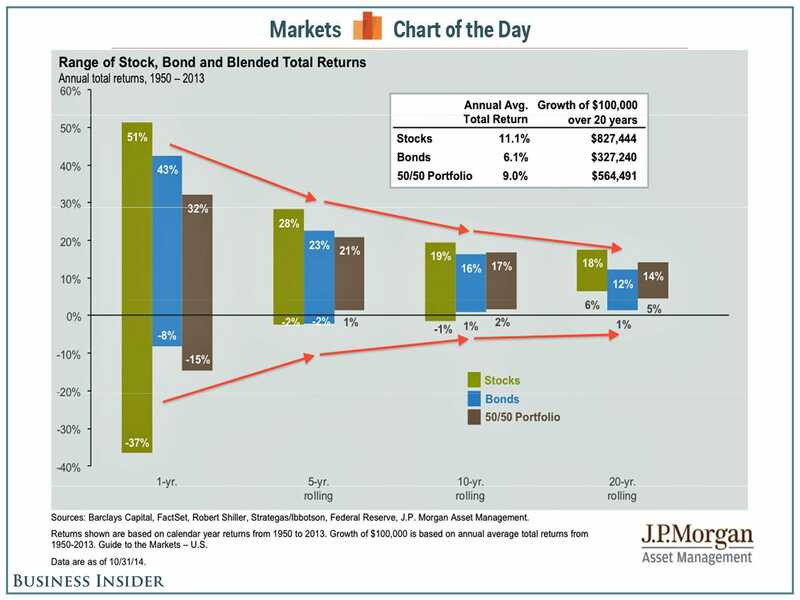 This eye-opening chart comes from JP Morgan Asset Management. It shows the range of returns on an annualized basis for stocks, bonds, and a 50/50 stock-bond portfolio over 1-year, 5-year, 10-year, and 20-year periods. The returns data is from 1950-2013. As you can see to the left, the stock market gave as much as 51% and took away as much as 37% in any given year. 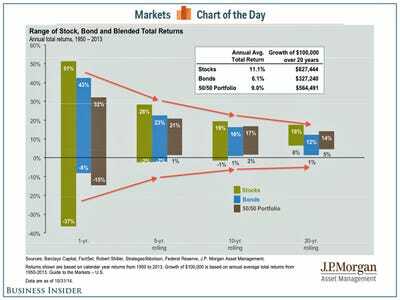 For an investor with a minimum 5-year investment period, a portfolio of stocks would have done no worse than -2% on an annualized basis while offering a return of up to 28% using the same calculation. If you extend the holding period to 20 years, you’ll see the worst you would have done is +6% annualized while getting +18% annualized in the best case. The average annualized returns for stocks during those 20-year periods: 11.1%. That’s very close to the 10% we’re taught as kids. Assuming history repeats, the longer your holding period, the more predictable and typical your annualized returns become.